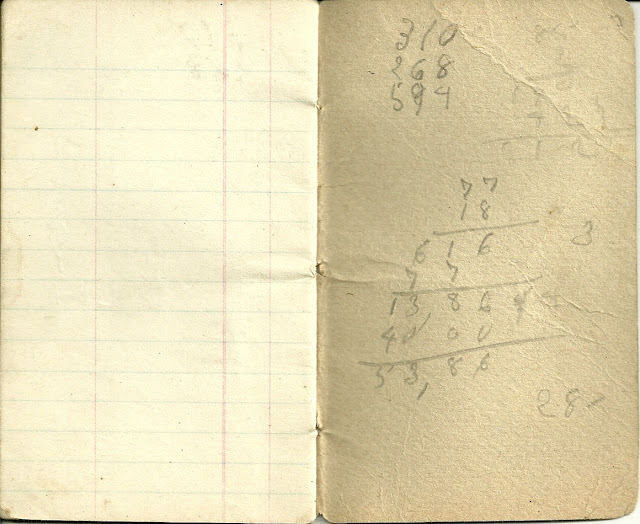 Tiny notebook in which Freeman Coffin of Lee, Maine, tallied how much bark he had peeled on the property of Loring for the firm of Plaisted & Son. The notebook also contains the name of Ira Knights. The notebook is only partially filled out. It's in fair condition, but better than you would expect for something used out in the woodlot. 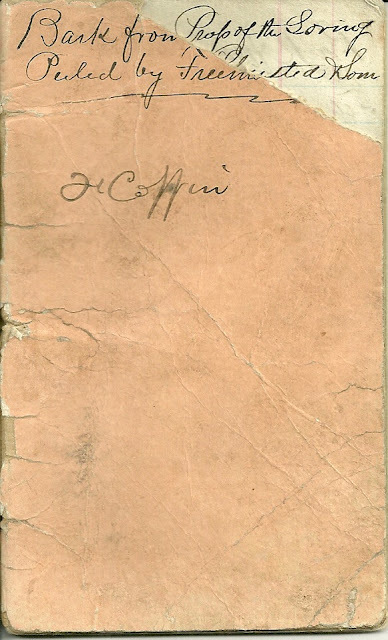 Freeman Coffin was born 17 May 1836 at Lee, Maine, the son of Walter and Nancy W. (Clark) Coffin. Walter was born 22 May 1811 at Lincoln, Maine, the next town over from Lee. Nancy W. (Clark) Coffin was born 25 October 1812 at Belfast, Maine, on the coast. Freeman's paternal grandparents were Nicholas and Lydia (Leman or Lemon) Coffin. Nicholas was born in New Hampshire on 5 April 1765. I found a birthdate of 5 Mar 1790 but Lydia (Leman or Lemon) Coffin, but would appreciate hearing from a reader with more information on her. Freeman's maternal grandparents were Ichabod and Mary Polly (Wiggin) Clark. Ichabod came to the Belfast/Lincolnville, Maine area from New Hampshire, where he was born about 1755 or 1760. Mary Polly (Wiggin) Clark was born 2 August 1770, but I'm not sure where. Her father Joseph Wiggin was born in New Hampshire on 28 April 1748. In 1862 Freeman Coffin married Rosaline Russell, who was born 1 September 1843 at Linneus, Maine, the daughter of John and Margaret (Morrison) Russell. John Russel was born about 1813 at Kingsclear, New Brunswick, Canada, from a Loyalist family, I believe. I found several John Russells in the Kingsclear area and wasn't sure which was the proper John. Margaret (Morrison) Russell was born about 1816 in Belfast, the daughter of Edmund and Jemima (Rumery or Rummary) Morrison. Lizzie W. Coffin, born 17 October 1888 at Lincoln, Maine; m. Harry R. Clark; she died young on 17 January 1908 of phthsis. Freeman Coffin died 26 October 1905. His widow Rosaline died 16 October 1909. The Ira Knights mentioned in Freeman's Coffin's notebook might be young man Ira A. Knights, born in March of 1858 in Maine, the son of Nathan L. and Sarah Angeline (Stone) Knights. Ira's paternal grandparents were Joseph and Rebecca (Johnson) Knights. His maternal grandparents were Enoch and Phoebe (Kneeland) Stone. Ira died of tuberculosis on 8 February 1903. Flora married Harry Kneeland on 21 April 1904. An excerpt from "The History of Penobcot County, Maine, with Illustrations and Biographical Sketches", published in 1882. You can read the book by clicking here. Hon. William Plaisted, of Lincoln, Penobscot county, Maine, was born October 24, 1815, in Jefferson, New Hampshire. He is a son of Deacon William and Nancy Plaisted. (For sketch of early family history see the biography of his brother, Governor Plaisted, which appears in this work). His father was a farmer and William spent his early boyhood, as so many of the prominent men of our country have done, in assisting at the farm work. He attended the district school and obtained such an education as was at that time afforded in the country public schools. Being the eldest of the family he early started out for himself, and when eighteen years of age we find him in Gardiner, Maine, sawing wood. This he followed but a short time, however, while looking for a better job. Being possessed of great energy and a determination to do well whatever he did, he soon obtained a situation in a tannery. Here, by close attention to the minutest details of the business, he soon had the confidence and esteem of his employers, and in a short time was advanced to the position of foreman of the establishment. Here he remained seven years, the last four years having entire charge of the business. 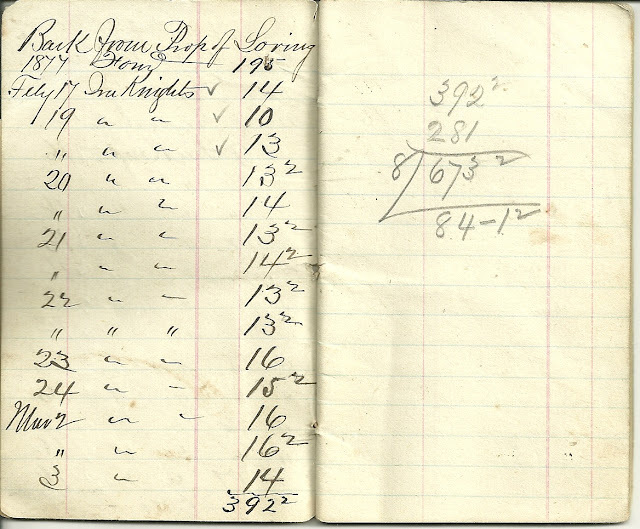 In 1840 he bought one-fourth interest in Cook & Nutting's tannery and began business for himself. He continued in business here for four years, when he went to Mercer and bought a tannery with his brother-in-law, Mr. Church. 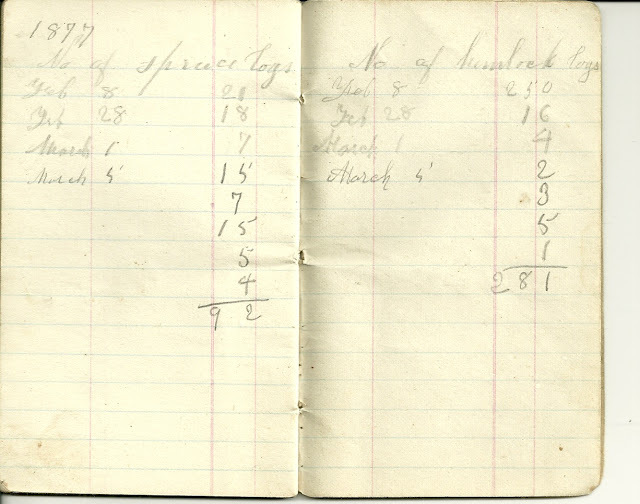 Though the tannery was in Mercer Mr. Plaisted lived in Augusta, and attended to the outside business, buying the hides for tanning and selling the leather. Here he lived for three years, and then went to Stetson and built a large tannery, with a capacity of about four hundred tons of bark yearly. He lived in Stetson and continued in the manufacture of leather until 1869, when he removed to Lincoln and built the large tannery here. In 1868 he bought the old tannery at Princeton and built it over, enlarging its size to about double its former capacity. 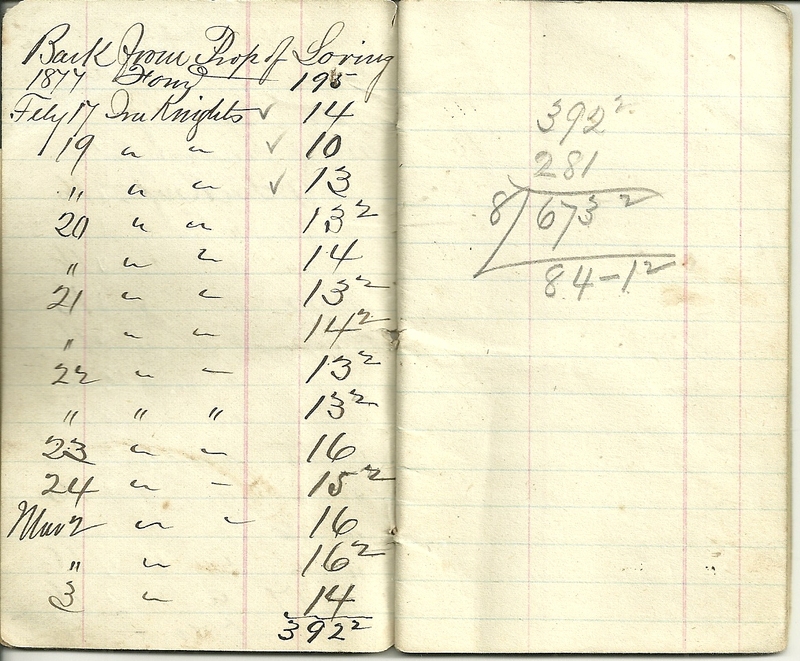 In 1869 his son Thomas was taken into the firm and the firm name has since been William Plaisted and Son. Their two tanneries have a capacity of 8,500 cords of bark per year. They make what is known as Buffalo Sole Leather, using almost exclusively Calcutta buffalo hides. They have $150,000 invested in the business, and manufacture from $150,000 to $200,000 worth of leather per year. Mr. Plaisted married Martha Forbes, of Windsor, Vermont, daughter of Absalom Forbes. They have had eight children—Lizzie, wife of Mr. Thomas Hersey, of Bangor; William P., now in Princeton, Maine; Thomas M., of Lincoln; Nancy, now Mrs. F. C. Plaisted, of Lincoln, and Harry, residing in Minnesota. The deceased were Mary E., Emma F., Jesse, and Charles. Mr. Plaisted in politics has been a Republican until the formation of the Greenback party. Believing in the principles of that party he has ot late voted with it. In 1868 he was elected to the State Senate, and filled the position in a manner satisfactory to his constituents. Since early boyhood he has been a member of the Methodist Episcopal church, and is a leader in all enterprises of public charity and the relief of the poor. He is a man very highly spoken of by his townsmen and respected by all who know him. He has by legitimate business, carried on as it has been in an honorable manner, acquired success in business life. Thomas Plaisted, who is associated with his father in business, was born May 18, 1848, in Augusta, Maine. He completed his education at Kent's Hill Seminary. He married Miss Emma Henrys, of Lincoln. They have two children—Ella and Marjory. In 1879 and 1880 he was elected a member of the Legislature on the Greenback ticket. Pam, I would love to learn more about how you came about using Wiggin for Nancy (Clark) Coffin's middle name. My cousin and I are on a family genealogy quest, and while we know she used the middle initial W in various places, we haven't been able to verify that it stands for Wiggin. Any help would be wonderful! I should probably take that out, as another person questioned it in an email. I read it somewhere but wasn't able to find it again to test its reliability. It could have been misapplied to her as I believe it was her mother's maiden name. Thanks for commenting! I also have some photos of Freeman and Rosalind. Wonderful! 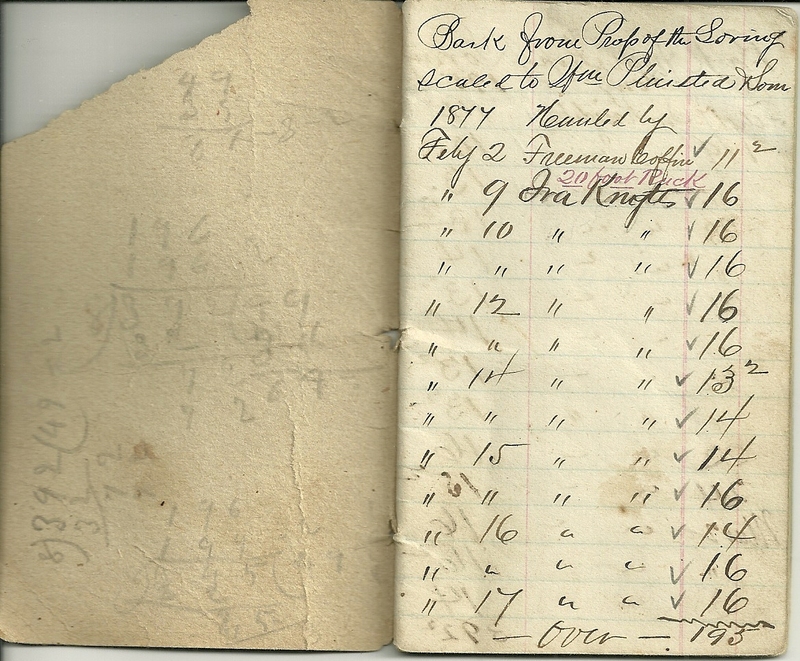 I hope you got a kick out of seeing your great great grandfather's handwriting. If you'd like to share the photos, I'll add them to this page and to Freeman's page at the Maine & Maritime Canada Genealogy network. My email address is in the right column near the top.